For our regular volunteers placed throughout the Aquarium, we have a six month commitment. But time and time again, we find that they stay past that initial commitment due to the meaningful experience they have working with our volunteer supervisors. 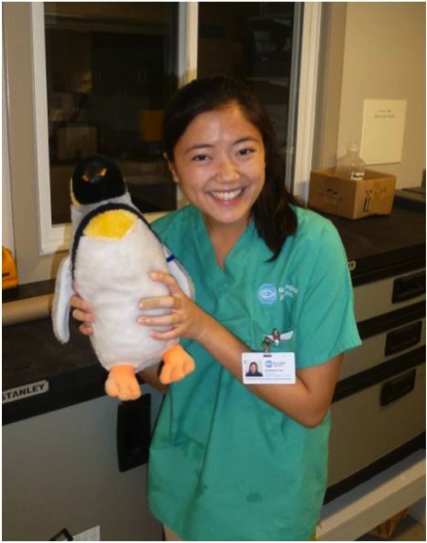 This month we are recognizing an exceptional volunteer who has completed that six month commitment and decided to continue providing impactful service to our Aquarium Medical Center (AMC): Samantha Yao. Sam has been an exceptional AMC volunteer. She originally began on Saturdays and was always there when I needed her. Whether a spur of the moment situation arose, or there was time for extra cleaning, Sam was a great help. She takes on projects eagerly and requires very little supervision. I always knew that the AMC was cleaned properly and patients were receiving great care when she was around. There were times that she kept things going for us in Boston while staff was busy in Quincy, and I never had any reservations about her ability. Sam recently moved to a Sunday AMC volunteer position, and although I miss her on Saturdays, she continues to excel on her new day. Her demeanor is so pleasant to work with and her work ethic is fantastic! We love having Sam volunteer with us, and she deserves the recognition as an asset to the animal health department. Thank you Sam for the skills and dedication you bring to the New England Aquarium!